How many colabs do we see these days, just in our own very small industry. Some work and some do not work. A concept that was born in 2014 that saw the amalgamation of Visionary Surfboards and Flow Surf School into another beast entirety. Drift. The North East coast of the UK is hardly the surfing mecca of the world, with cold water, colder air temperature and one of the highest rainy day records in Europe it does not lend itself to thoughts of surfing paradise. Maybe though, that is one of the reasons I would go there, I have heard rumors of perfect point breaks, secret spots to rival world tour destinations and some of the friendliest humans on the planet. 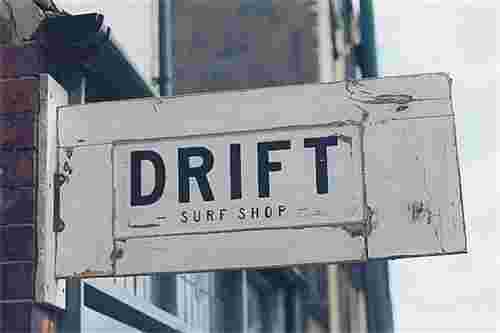 As the Surf Bunker travel budget consists of the diesel to go for a surf at my local break, I thought it might be a good idea to ask Richie from Drift Surf Shop in Saltburn (North East England) what it is like to live, surf and own a business in this unlikely surf town. SB: Hey Richie, thanks for sparing us the time, how did Drift come into being? Richie: I'd always had it in the back of my head that I wanted to open a surf shop but the timing never seemed quite right. I've been surf coaching since 2004 and started my own surf school in 2009, Flow Surf School in Saltburn. I got chatting to a good mate of mine, Glenn Nary from Visionary Surfboards about how I'd always wanted to open a shop and he seemed pretty keen on the idea but it's a near impossibility to get a shop in Saltburn. We were both inspired by what Mollusk were doing in California and I love the Patagonia store in Haleiwa. Then one day out of the blue someone mentioned that a tiny shop was coming up for rent, so we went to see the landlord and shook on it there and then in his front room. I walked out of his house in slight shock and I think Glenn and myself had a few sleepless nights once the reality sunk in that we'd just started another business. Within 6 months we'd moved to a bigger premises and have our own line of clothing which has gone down really well. Our tee's have been sent as far away as Australia and Tahiti. SB: It looks like you guys have really cornered the market in Saltburn, are there a lot of surfers in the area? Richie: There was already a surf shop in Saltburn run by a good friend of ours, Gary Rogers who is a local legend. But there was room for another shop in the town as the number of surfers has increased hugely over the past 10 to 15 years. There used to be no more than a handful of us in the water and we all new each other well but now I probably only recognise a quarter of the people in the water, it's certainly boomed and I think the accessibility of having surf schools in the area and the advances in wetsuit technology have played a big part in the increase in surfers. SB: The boards that Glenn makes look amazing, where does he get his inspiration? Are they tailor made for the local area? Glenn (Visionary): We enjoy getting creative with the boards and doing more specialized finishes, resin tints, gloss finishes, etc. Over time the demand for these has increased to a stage where now they make up the majority of the boards we produce. Inspiration comes from all over, quite often the customer will be very specific about what they want but if we have free reign on a board then there's always a big discussion, we generally start with a colour scheme and try to work out new ways of putting it together, or experimenting with glass patches to make different shades of colour. There are loads of shapers and glassers that really inspire us too; Empire Surfboards, Album Surfboards, Almond Surfboards, Dead Kooks, The Lucky Bastards, to name but a few. There are so many amazing and creative shapers and glassers around that make surfboards that are functional works of art, that's how I like to see the boards we create. I think that all custom surfboards are tailor made for the local area as much as they are for the individual surfer. We're fortunate in that we have a good variety of waves locally from average beach breaks to world class not so secret spots right on our doorstep :-) so we get to shape all kinds of boards, performance shortboards, retro fish, mini Simmons, noseriders. I love the variety. SB: I have heard rumors about a secret but not so secret spot near you. Left hander that needs some swell. Some people have said one of the best waves they have ever surfed. Any truth to that? SB: Do you find it difficult to get amped to get in the water when it is so cold? Richie: One of my very good friends in Ireland said to me years ago that the day he doesn't want to put on a wet wetsuit is the day he gives up surfing and I've lived by that ethos ever since. I don't plan on ever giving up sliding a few walls so it's not too hard to stay amped. I've embraced my inner grom! SB: Where wetsuits are concerned, which would you say are actually the warmest for your buck? Richie: Wetsuit technology is incredible now. I can't believe we used to surf 4 degree water in those old suits from 20/25 years ago. As for the best wetsuits for your buck I'd always go with O'Neill, they put so much money into R&D and the flexibility is insane but there are a whole load of companies out there making amazing products including some environmentally friendly options which I think will be the next big thing in wetsuit development. SB: What in your opinion is the key to giving a good surf lesson, what makes Flow better than the rest? Richie: For me it's about providing a personal service and making sure people leave with a smile on their face, a bit of after surf 'glow'. I still teach all my lessons rather than employ someone else. I work right through the winter and it can be hard stood in the water for 2 hours when it's freezing cold but just seeing someone get the stoke and maybe start on their own surf journey makes it all worthwhile. SB: Can you remember your first Surfboard? Have you still got it? Richie: My first proper board was a 6'10 from Boardwalk surf shop in Newquay. I bought it in 1994 and took it to Bali the same year. I snapped it at Nusa Dua. I shouldn't have been out to be honest, I'd only been surfing for a year and came away with a few scars from the reef that year! Richie on this super tasty looking right hander is an example of wave quality in the North of England. Just something Glenn whipped up. We talk to Nico from Buster Surfboards about the Eisbach river wave in Munich. Nico enlightens us on what sort of board is best for the river wave, who he looks up to in the shaping bay, when is best to go and the general do's and don'ts.